Keyboard shortcuts are typically an alternate means for invoking one or more commands that would otherwise be accessible only through a menu, a pointing device, different levels of a user interface, or via a command console. Keyboard shortcuts generally expedite common operations by reducing input sequences to a few keystrokes, hence the term “shortcut”. Adobe Photoshop CS3 is a huge program full of buttons and options that can be used for many different purposes. Keyboard shortcuts can improve your efficiency, and in some cases, they can even invoke commands that might not otherwise be available (e.g., zooming while a dialog box is open, or inserting a Select forward layer command into an action). Knowing keyboard shortcuts help you work more efficient and work faster! Below are many of Photoshop’s keyboard shortcuts resources. Some of them are the little known, hidden keystrokes! There is a PDF, printable versions, or just scroll down to find the shortcut you need. Feel free to LINK to this page! Enjoy…. 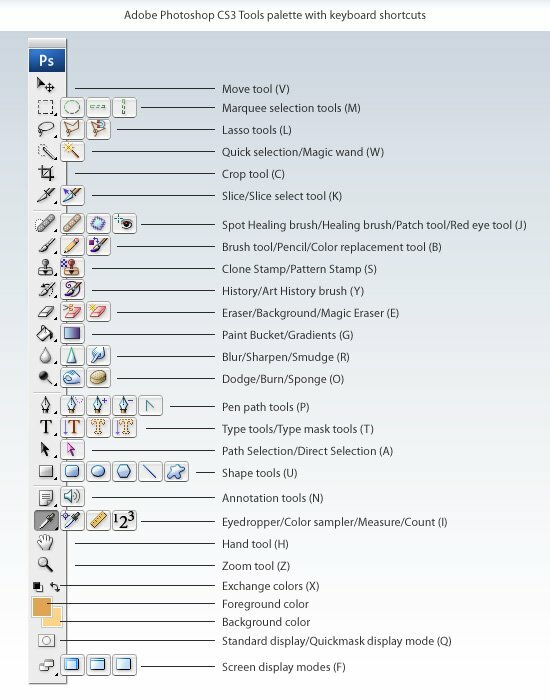 The Adobe Photoshop CS3 Tools palette layout has 60 separate tools. If you leave your mouse cursor over the tool Adobe Photoshop CS3 will indicate the name of the tool and the keyboard shortcut to use the tool. You can use associated keyboard shortcut to quickly select a tool without having to always use the Tools palette to select the tool you wish to use. For example, pressing B on the keyboard will activate the Brush Tool in the Tools palette. Where more than one tool shares the same keyboard shortcut, you can cycle through these other tools by holding down the Shift key as you press the keyboard shortcut. Keyboard Shortcuts for Photoshop’s Layers Palette. It’s a sign you know your way around Photoshop when you’ve mastered the keyboard shortcuts for the Layers palette. Here is a quick reminder: Combine the bracket keys [ or ] with Option/ALT to select the layer above or below; Use Command/Control to move your selected layer up and down. I’ve found a full set collection of Adobe Photoshop Keyboard Shortcut at KeyXL. In Photoshop, shortcuts are customizable by using the Keyboard Shortcuts command. Choose Edit > Keyboard Shortcuts. 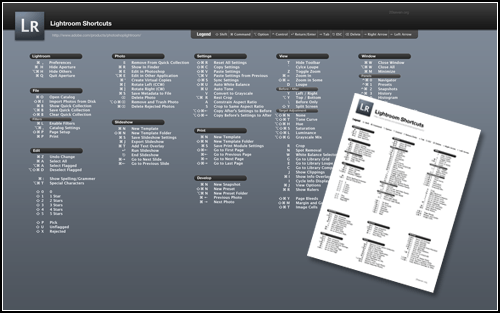 Trevor Morris Photograhics’s Adobe Photoshop keyboard shortcut cheat sheets for CS4, CS3, CS2, CS, 7, 6, 5 for both PC an Mac.